Hey Bart- just wanted to say this is super cool. I bought your grbl pen plotter board several months ago and have finished designing and assembling a small plotter. I’m about to begin testing the electronics…I’ve resolved to finish it in it’s current config but maybe my next one will be running on ESP32! thanks for your hard work, it’s appreciated. 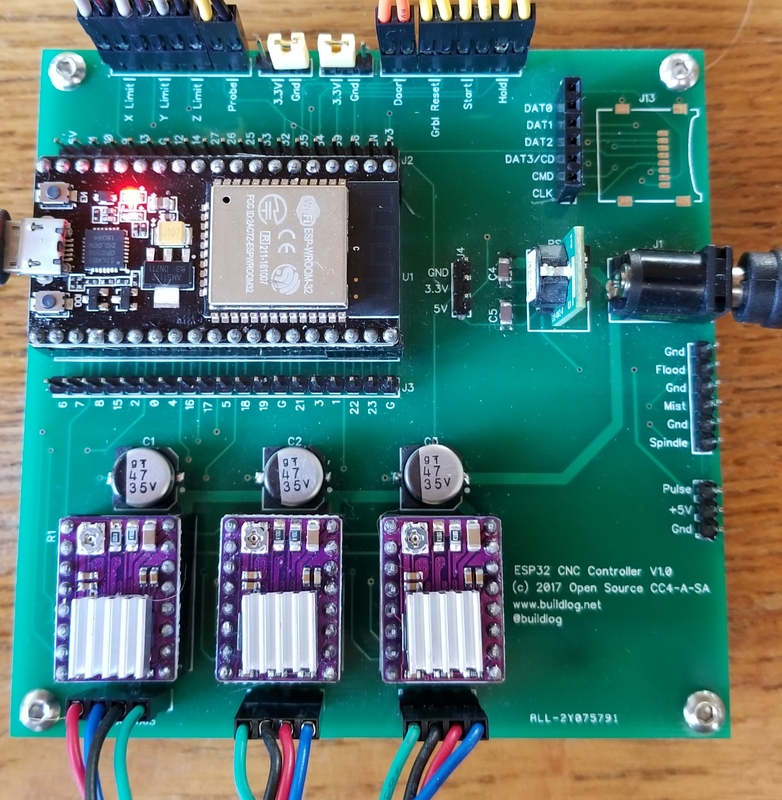 The ESP32 is perfect for tiny machines that need a few tweaks to normal Grbl. It has the code space, peripherals and speed to deal with them. Great project I admire your work. Will you be selling the pcb that you have designed if so I will buy one please let me know how much you want for one. I have a extra blanks of this PCB. I’ll let you know if I decide to sell them. I probably won’t know for a few weeks. Great project I admire your work. Will you be selling the pcb that you have designed if so I will buy one and pay for postage please let me know how much you want for one. Thank you Bart for your prompt reply. I think you have a winner here have you thought about putting together some self assembly kits a la http://www.Protoneer.nz with their self assembly kits for the Arduino CNC shield? @ Colin I will probably do that soon. I made the prototype PCB about 25% larger than it needed to be to make it easy to wire and probe. Do you prefer a large board (100mm x 100) or smaller (70mm x 70mm)? Iwould stick with the larger board as space is not a problem for this type of project. It also leaves room for some later customisation if required. The Souce on Git Hub does not compile on latest Arduino IDe, With the Last Git Update. Been waiting for this for a long time. I have been playing with ESP8266 and ESP32 for some years now and could not understand whe grbl and even Marlin hasn’t been poorted. I’m not skilled enough to do it. I’m now building my controller from your design on a protoboard (the customs and tax are crazy if I order from the US, Sorry) for testing. I love the work on grbl but as several others missing the 4:th axis. Any plans on that part? Adding additional axes in firmware is not very hard. They do take additional I/O for step direction and possibly a limit switch. The I/O is very flexible, but some features would need to be sacrificed. I will probably do this in a few weeks. with a protoneer cnc shield eg https://blog.protoneer.co.nz/arduino-cnc-shield/ ? I guess in the original GRBL it was necessary to have the step and direction pins on one cpu port..is this still the case with ESP32 GRBL? I think so. It is unclear exactly how much flash you get. You might have to disable some features like OTA (Over the air) firmware updates if it is below 8M. You would also have to create a custom cpu_map.h file to match the pinouts. If someone wants to donate some hardware, I will document all the steps.